YES! 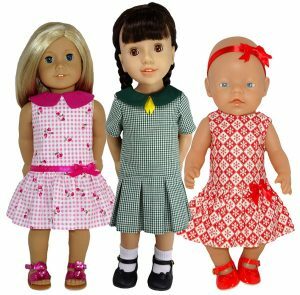 I am so thrilled to release my wonderful new Drop Waist Dress 5 Ways pattern for the 18 inch and American Girl size dolls. As the name indicates, I show you how to make this super cute pattern 5 different ways. Funny thing is, as I’m writing this blog I’m thinking, ‘Wouldn’t it look gorgeous as a full-length evening gown AND with a layered skirt too!’ Oh well, they’re easy adjustment that you can make by adding extra to the length of the skirt or adding an additional longer layer, or shorter layer. This all means that this pattern is awesome value and you can create many more than the 5 variations that I show you. It sure was a major task planning and getting all the video instructions in just the right order to cover all the different variations included in this pattern but I’m thrilled with the final result and I’m sure you will be too. Because of its design, this pattern also looks great on other 18 inch dolls that are a little slimmer than the American Girl doll. As you can see from the photo above, it fits the shorter 17 inch Original Baby Born doll too! And as with all my 18 inch American Girl patterns, this pattern includes alternative cutting line for the 20 inch Australian Girl doll. ‘Sew’ get your Drop Waist Dress 5 Ways Pattern for 18 inch and American Girl dolls today and start creating a gorgeous dress or 2, or 3, or 4, or 5, or…….